This all seems to be a movie, you wish it was just a scary movie. Dogs being bludgeoned to death with metal rods before being disemboweled and dismembered in front of the other dogs, some restaurant owners claim the pain and fear makes their adrenaline-rich meat tastier. It is a scene from a nightmare that will haunt you forever, yet most people on this planet do not act. We are not talking about invading the countries and with force change their way of life, we are aiming to totally isolate the from the rest of the world, no more financial or commercial cooperation, no more aid or have an option to be involved in global decisions. In countries, other than South Korea, the majority of dogs killed are either family pets stolen from homes and gardens, roaming "community" dogs or strays snatched from the streets. Dog and cat thieves use a variety of methods, including poison, and sell the animals to traders and restaurant owners. It is quite common to find dogs on trucks headed to slaughterhouses still wearing their collars. In South Korea, most of the dogs are born on the farms in an endless cycle of breeding, but some are stolen or relinquished pets, or animals raised for the pet trade but not sold as a puppy. Most Dogs are crammed by the hundreds, onto the backs of trucks, packed so tightly in cages that they are unable to move. In Vietnam, it is common for dogs to be violently force-fed with a tube down the throat to boost their weight before sending them to slaughter. Dogs are typically driven for days or weeks, often sick and injured, and many die from suffocation, dehydration, or heatstroke long before they reach their destination. Dogs on South Korean meat farms are kept locked in small, barren metal cages, left exposed to the elements, and given just enough food, water or shelter to keep them alive. HSI has uncovered appalling conditions where disease and mental distress are rampant, with many dogs showing obvious signs of sickness, depression, severe malnutrition, and abnormal behavior. These dogs will eventually end up at a slaughterhouse, market, or restaurant. The method by which they are killed varies: in South Korea, the most common method for slaughtering a dog is by electrocution, but hanging and beating are also used. 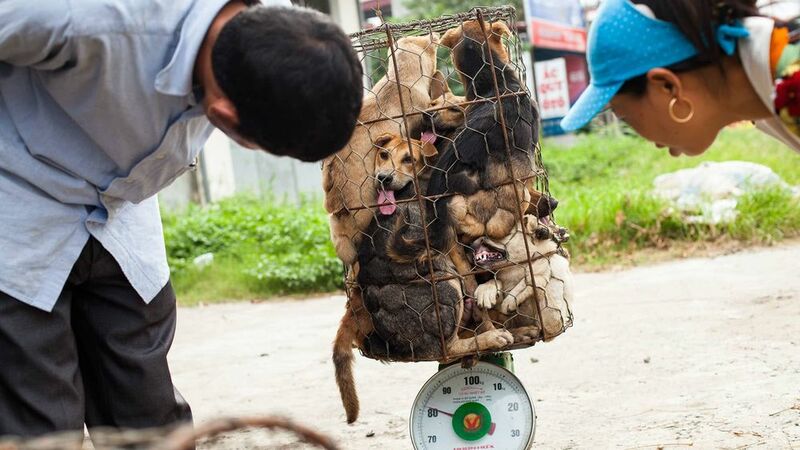 In China and Vietnam, dogs are usually beaten to death with a metal pipe and then bled out from a cut to the throat or groin, but they can also be hanged, or thrown conscious into large drums of boiling water. In some cases, the treatment of the animal prior to slaughter is deliberately cruel because of the misguided belief that torturing a dog prior to death results in better-tasting, adrenaline-rich meat. An estimated 30 million dogs are killed for human consumption each year across Asia in a brutal trade that involves terrible cruelty to animals and often, criminal activity. From 10-20 million dogs are slaughtered in China, 2 million in South Korea, and around 5 million in Vietnam; 80,000 or so of this last group are imported from Thailand, Laos, and Cambodia. This is man’s best friend, it is said they derive as far back as 14,000 years ago. Their cousins, the wolf have roamed this planet for 60 million years. This is how we decided to honor the presence. It is not enough for the animals consumed already in the everlasting meat industry but we also need to eat cats and dogs. It seems that humanity will eat anything that moves and it will not be long until someone starts the rumor that human meat carries a magical healing power. Action is needed and it was needed yesterday. This planet needs to unite behind one belief, this is not the future we want our children to inherit, this is not humane, this is not humanity!